*sniffle* I want Rampage. I was all set last night to buy it with my Sephora $20 VIB GC, but it was OOS. I got Muse instead. Thank you for the comparison swatches, those are GREAT! I have lots of great greens, but IMO, there's no such thing as 'too many' so I'm caving on this one. Hrm. The slight dustiness of Enchanted Forest helped me realize I am a pure/saturated-green kinda girl (Nubar Forest is a fave! ), so hearing that Wandering Vine has a bit of grey in it kills my lemming. My aching wallet thanks you! Greens are so welcomed! Although I cannot get enough of sparkle or holographic goodness! Guess I'll have to get that green. =) Thanks for comparisons. They're always so useful. I like Rampage the best, but the Orly WV takes second place! For a non-fanatic they would all look alike. Here's another gorgeous green I need. Your nails look so pretty. That green is amazing. Impossible to explain to my friends and family why Rampage is any different from Wandering Vine. I will end up getting both. Thanks for the comparison swatches! 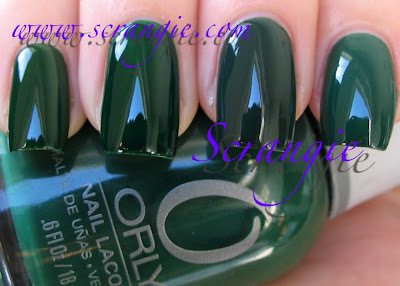 I'm getting RBL Recycle during the sale next Tuesday but I still think I need this new Orly green along with the cute pink they have in that collection. Rampage is THE green for me. It is my favorite green and color. Thanks for the swatches! this is the best green nail polish i have seen in the longest time. it puts chanel jade to shame, seriously.